In an economic situation that has every industry down, down, down, it’s invigorating to hear upbeat stories any time. Such a story exists for the down and out real estate broker. Ottowa real estate saleswoman Marnie Bennett is the hero of this positive piece on “how to sell property in a depression.” The No. 1 Broker Worldwide for Keller Williams Realty International in 2010 sold over 600 properties last year, beating out over 80,000 agents worldwide. 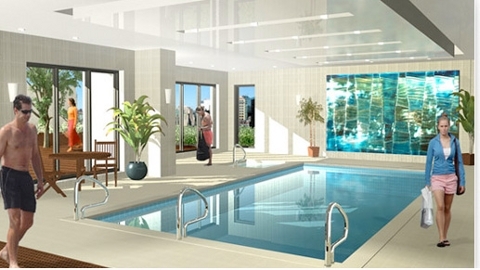 Bennett’s climb to her exalted position as condo monarch came about when she agreed to help with Terry Guilbault’s $60 million condominium development at 90 George St (pool image above). on the edge of the ByWard Market. About this time industry experts began to realize Ottawa’s potential as a condo market. The image below from Marnie’s Facebook albums with Prime Minister Stephen Harper, and her son Taylor, indicate just how hard work and intelligence pay off. In reading this story of Bennett’s successes, it’s fairly plain to see that focus on what works, hard work, and leadership is what brings home the bacon, good times or bad. Bennett recognized the market and has applied whatever momentum necessary to succeed. In this most recent case, in the worst economic times since whenever, has been marketing. The woman knows her business in all aspects for sure, but beside the Ottawa statistical advantages, presenting properties to the right people, the right way, and with ultimate credibility, this is how an agent gets to be the best in the world. If there is one chink in Bennett’s silver armor it is the landing page and navigation of her company’s website, I hate it (which is important cuz of my website guru status). Along with all her other tasks Marnie Bennett also finds time to blog about the industry. In fact her network of websites and blogs is quite extensive. And it’s not every zillionaire real estate broker that has their own Blogger profile. Better with Bennett, Tailor Bennett’s blog, Ottawa Real Estate Pros, and several others compliment Bennett’s overall web footprint of Facebook, Twitter, YouTube Channel, and other digital engagements. All in all, Bennett’s endeavors appear as a sort of digital and brick and mortar empire to me. Not many firms of any kind have such an integrated and connected approach. And maybe herein lies the lesson. This is a great success story, but with every great story there should be a moral too, don’t you think? Every day I hear not only real estate professionals, but professionals in all industries in fact, whine about how bad things are for them. Certainly, these times are tough for everyone – even here in Germany, in our business. But! (always pay attention to what comes after “but”). As a professional, the most important thing you can do today is – get off your duff and get busy. I leave you with another tool Bennett utilizes, one I found via her Tweets (that’s a Twitter message) linked to one of her properties – the tool is MyVirtualListings – it puts your client there – click & watch via the image above, or the video below – compare to your 300 pixel online presentation. Congratulations Marnie, and thanks for the lesson of the year. Just spoke with Steve Winogron about your toronto condo investment plan. How can I get involved from here in California ??? ?